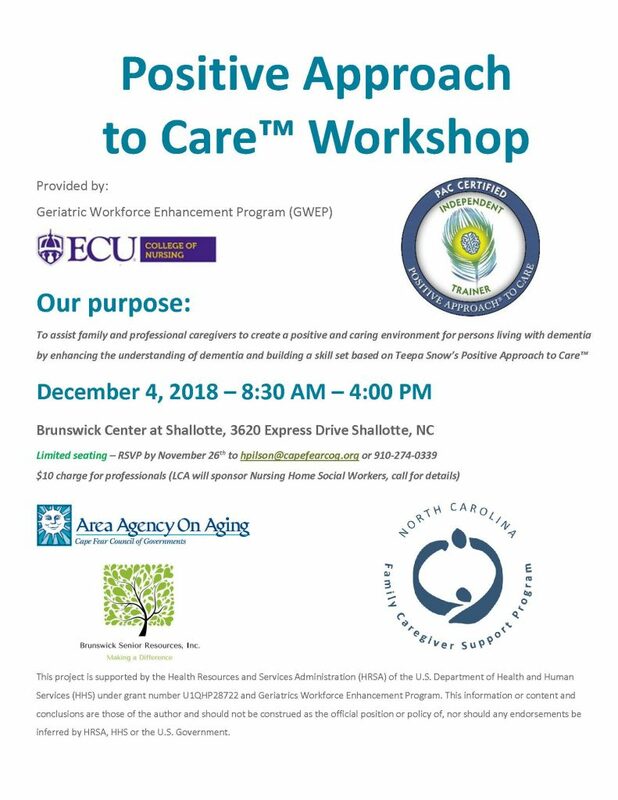 A “Positive Approach to Care” workshop for persons living with dementia and their caregivers will be held Tuesday, Dec. 4, 8:30 a.m. to 4 p.m., at the Brunswick Center at Shallotte (3620 Express Drive in Shallotte). The workshop is intended to create a positive and caring environment for persons living with dementia by enhancing the understanding of dementia and building a skill set based on Teepa Snow’s Positive Approach to Care™. There is no charge for family or unpaid caregivers and lunch is included. There is a charge of $10 for professionals only. Seating is limited – RSVP by Nov. 26 to hpilson@capefearcog.org or by calling 910-274-0339. For more information, view the flier below, or click here to view a PDF.